The geo-tagging on Stickerkitty’s map is coming along slowly. It takes a little while to set the GPS on the camera, so I need to be careful out in public so as not to draw attention to what I’m doing. Not that anyone really cares, but I like to keep a low profile. It’s also taking a long time to load photos onto Flickr, though that might be a slow Internet connection. The few I’ve loaded so far are showing locations perfectly! The next thing to do will be to figure out how to tag with words and whether to limit subject headings to 20 or 30, or just tag at will (which has never worked well in the past). I’ll tackle that later today. I awoke before dawn to the sound of a fox barking on the grounds of the nearby Bötzow-Brauerei, and Alexanderplatz was pretty deserted this morning before the busloads of tourists arrived. I picked up about 50 stickers in two hours, including: Violent Frustration, Capital Grind Chaos; Wir sind die letzen 10% … und bleiben hier! ; Artgerecht statt ungerecht! 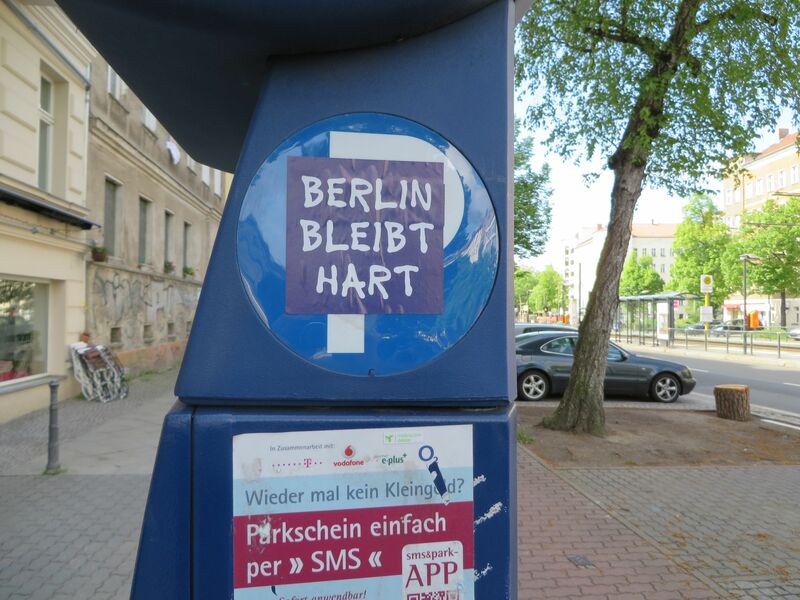 ; Fight for the Cuban Way of Life; and Berlin bleibt hart.